Like Steve Bannon at the Breitbart office, Lewandowski stays upstairs when he’s in town. The lower floors house a lobbying firm and sometimes a radio show. “You could call this the Turnberry embassy,” said John Fredericks, a friend of Lewandowski’s who sometimes broadcasts his syndicated radio show, “The John Fredericks Show,” out of the dining room and allowed a POLITICO reporter to join him there. Pressed on that description, he corrected himself. The clearest evidence linking Lewandowski to Turnberry, though, may be the row house. Asked whether the house was Corey’s personal office or Turnberry’s offices, Fredericks said there wasn’t a distinction. The house, built in 1900, is owned by the Citizens United Foundation, according to Washington, D.C., property records. It’s not clear whether Lewandowski, Turnberry or another entity rents the house or whether Lewandowski is allowed to use it for free. Lewandowski worked with David Bossie, Citizens United’s president, on “Let Trump Be Trump: The Inside Story of His Rise to the Presidency,” a book due out next month. Bossie did not respond to requests for comment. One of those friends, Fredericks, said Lewandowski will sometimes “just come downstairs and pop on” his radio show. 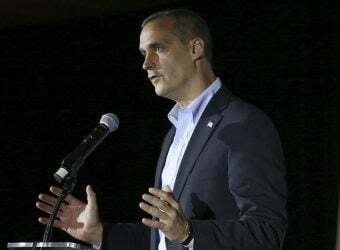 The house also provides nods to Lewandowski’s new influence in Washington, a city where few had heard of him before he took the helm of Trump’s campaign in 2015. Read the full article from Politico.